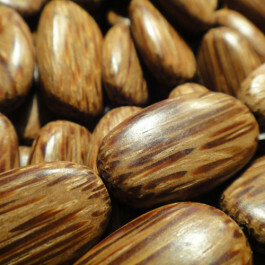 Palmwood Wood Beads Flat Oval 25x15mm (~16pce Strand) - 40cm/16'" Strand. Coconut palm wood is a by-product of coconut production from plantations in South East Asia. The colour range is golden with dark brown flecks. They have no annual growth rings or branches which means they are free from knots and other imperfections.